Nancy Elphingstone grew up in Lee County, the youngest of nine children. She was expected to attend college as all six of her older brothers had gone to college after high school, but it was not easy for any of them. While the youngest six children were at home, their father died of a massive heart attack, leaving their mother to raise the six children - ranging in age from 15 to infancy - alone. With her support, each of the six graduated from high school, then pooled their scholarships, student loans, and income from summer jobs and part-time work during school so they could graduate. Five of the six received degrees from Arkansas State University and three married fellow Arkansas State alumni. Nancy also has a niece with a degree from A-State. Arkansas State has played an important role in the Elphingstone family's ability to have successful careers. 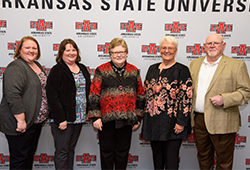 This scholarship dedicated in Nancy's estate will go to a student from Eastern Arkansas raised in a single-parent home in memory of her mother, Madge Howe Elphingstone, and sister, Madge Elizabeth Elphingstone, and in honor of all her family members who have and will attend Arkansas State.